Please refer to our stock # gj1 when inquiring. 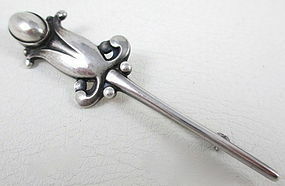 This lovely vintage pin was made by the Danish firm of Georg Jensen and measures 3" long x 7/8" wide. It is made from cast sterling silver and has a beautiful surface patina. It is in excellent condition and the reverse side is hallmarked "Georg Jensen" in a dotted oval, as well as "Sterling Denmark 121".